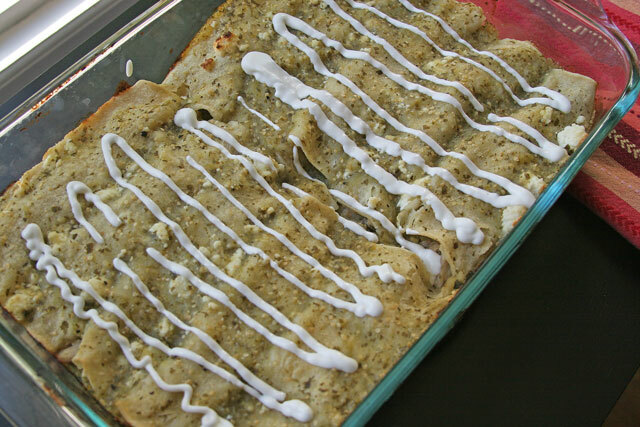 These are my all time favorite enchiladas. 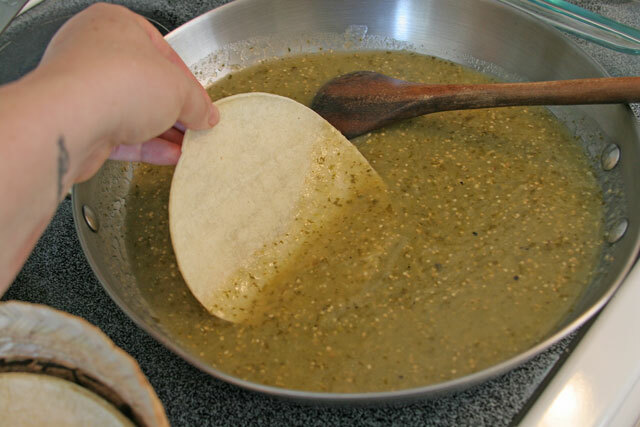 I am a green salsa lover, I can pour it on just about everything. The more the better/happier/yes please. I find myself, again, making things that are my favorite, and dear to me. It brings a certain comfort to my soul. I have been away from my Mama, brothers, and best friend for a year and a half now, but it is still hard these days. My people, and Brian truly appreciate and understand my quirks, personality, and love. It is unique when someone totally gets you. I have a father in law that gets me, thank goodness, because I can be totally weird most of the time. No explanation needed for certain behavior, and I can honestly say that is the reason my bonds are so strong with these people. That is something I have always been a fan of in any relationship, be it boyfriend, friend, or family. When someone just gets it, they are a keeper. My cats get it too. That is how my best friend Elon and I have been friends for over a decade, which is not easy for either of us. But just the other morning we had the best conversation in the world. We were laughing the entire time, understanding every nuance of that conversation made it what it was, perfection. It lasted all of about five minutes, just what I needed. A reminder that although I am the one that moved two states away, we make these certain bonds that are irreplaceable, special on their own, and I am so grateful for them. They are what get me through some hard times, and I could not be happier that they are a part of me. I know it is silly to some, but these enchiladas are like my people, near and dear to my heart. I made the chicken, and salsa the day before to make life a bit easier for this dish. And I bought the Mexican Crema at the Mexican grocery store. But all of the mega stores carry it nowadays. They also carry queso fresco in case you are not up to making it from scratch. Shredded Mexican Style Chicken, if you want to cheat or are short on time use any chicken you have on hand, or a whole roasted one from the store. Queso Fresco, store bought or try this easy recipe. 1. Warm the salsa in a saucepan, dip tortilla into the sauce, allow the tortilla to warm up slightly, enough to loosen up so you can roll it, about 1 minute. 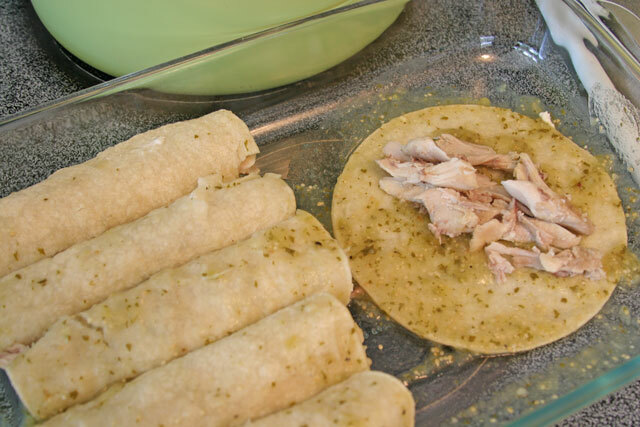 Place the warmed tortilla into the pyrex, fill with a small amount of chicken, 1/4 cup or so, then roll it. Tuck it firmly into the corner, and keep rolling. 2. Once all of the tortillas are roilled with chicken, pour salsa, about 1/2 cup on top of the enchiladas, and sprinkle queso fresco on top. Bake in the oven for 20 minutes. 3. Remove from oven, and serve immediately. Serve with more salsa, queso fresco, and Mexican style Crema on top. Tortillas, saucepan with salsa warming, shredded chicken in pot, pyrex pan, cheese. 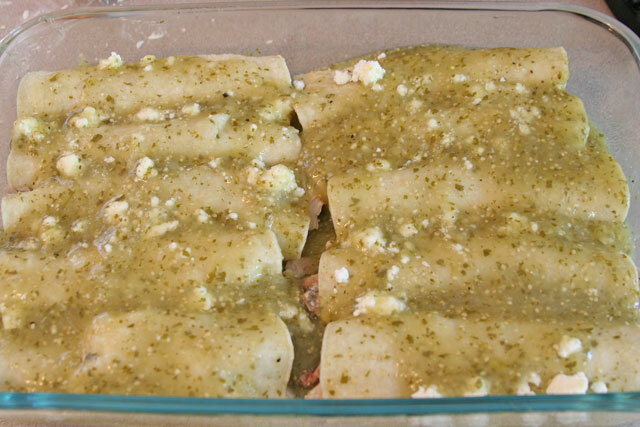 Enchiladas verde are my favorite, delish! 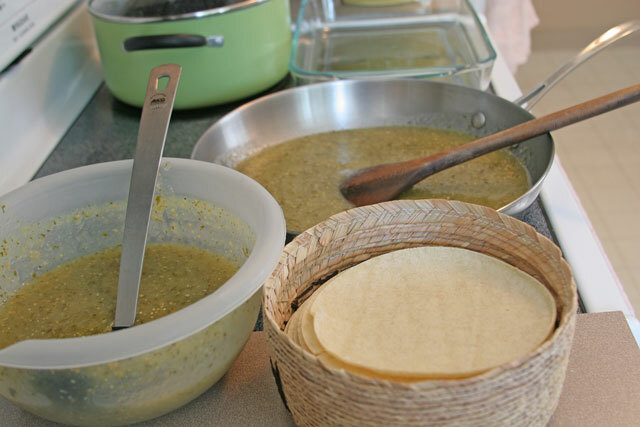 I am salivating over the fresh salsa verde recipe! Yum! !